After Bollystalgia and others curate a collection of Sridevi's finest works (define as you wish), I will be more than happy to dig into her filmography. But before? No. Hell no. The Sridevi films I am able to get my hands on tend to be from my own personal Era of Doom, i.e. circa 1984 to 1998, Mr. India aside, and as much as I want to participate in group projects and learn more about a star with whom I am so ill-acquainted, I even more want to avoid-yaar the pants off of 1984-1998 unless guided with precision and care. So with no DVDs handy but wanting to contribute, I decided the safest approach for me was to explore clip by clip. Lured by Temple and others who have a taste for outrageous and spectacular song picturizations, lately I've been wading far into the depths of youtube by clicking link after link in that ominous but irresistible column labeled "suggestions." My experiences in the never-ending cinematic Choose Your Own Adventure of remarkable, if not always perceptibly affiliated, links made me confident there would be a ton of inspiring Sridevi songs and scenes out there for me to write about. But how to choose? The connections between the principal video on a page and the suggestions youtube throws up (ahem) are not always clear to me, but in the spirit of discovery and wonder - of -palooza! - I wanted to avoid getting a chain of clearly associated clips, like a group of songs from the same film or all featuring Sridevi with the same hero. Instead, I went with a random approach. Yesterday, my simple search on youtube for "Sridevi" yielded approximately 5,180 hits. I then used a random number generator to pull 5 numbers between 1 and 5,180 to create my list of videos to write about during Sridevipalooza. However, apparently youtube will not actually pull up the hits after 1,000, so I had to run the number generator a few more times to get 5 selections between 1 and 1,000. * Just kidding! I lurve you, internet! You may need to extend your personal Era of Doom to include 1983. Just wait till you get to the huge song/dance numbers with props like brass pots, feather dusters, and giant severed hands. The 80s was AMAZING!!! Just you wait, you WILL end up loving it! Beth, it's like you can READ my MIND. Sepia Mutiny had a link to a Sridevi song in a recent post (the awesome and amazing "Main Teri Dushman" from Nagina), and it made me think that I really need to watch some Sridevi movies. Except -- which?! Other than Mr. India, I don't know where to start. 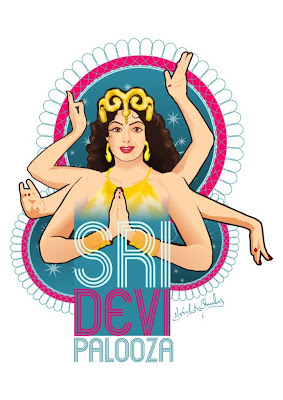 So I love your YouTube spelunking idea, and I'm definitely going to try to follow Sridevipalooza everywhere it occurs. It's for my own good.